Abstract: Chronic low back represents one of the major causes of disability worldwide. Our narrative review has the purpose of highlighting the evidence supporting the different rehabilitative techniques described for its management. In total, 26 studies were found suitable to be included in the review (14 articles about pilates, six about McKenzie (MK), one article about Feldenkrais, three about Global Postural Rehabilitation (GPR) and two about Proprioceptive Neuromuscular Facilitation). The effect of exercise therapy was examined for each single study through changes in the main clinical outcomes (pain, disability,) quality of life (QoL) and psychological aspects and the targeted aspects of physical function (muscle strength, mobility, muscular activity and flexibility). All the techniques are effective for the study groups with respect to the control groups in reducing pain and disability and improving the QoL and maintaining benefits at follow-up; pilates, Back School, MK and Feldenkrais methods reduce pain and are more efficient than a pharmacological or instrumental approach in reducing disability and improving all psychological aspects also. GPR shows long lasting results for the last outcome. To date, it is difficult to affirm the superiority of one approach over another. Further high quality research is needed to confirm the effect of these techniques, together with the use of more appropriate evaluation measures. Chronic low back pain (CLBP) is defined as a pain that persists for more than 3 months, or longer than the expected healing period; it represents one of the most common and costly musculoskeletal problems in modern society.2 CLBP is experienced by 70%–80% of adults at some time in their lives.3 Its management comprises a range of different intervention strategies including surgery, drug therapy and non-medical intervention like rehabilitation. Specifically, the guidelines of the American College of Physicians associate good efficacy of Yoga postures, Tai-chi exercises and the pilates method with recommendations of therapeutic exercises; the Nice guidelines also recommend core stability exercises, the MK method, the Feldenkrais method, the hydro-kinesio-therapy and aerobic exercises, while the approach of the Alexander method appears to be of less efficacy in CLBP.17,19 The aim of this narrative review is to provide the efficacy of different postural exercise interventions in reducing pain severity and their impact on function, QoL and healthcare use. However, despite recommendations in postural exercise guidelines, there are no specific indications for clinicians in the choice of the most suitable postural technique or in the duration and the way of prescription of these exercises. A narrative review of the literature was performed using the following search engines: PubMed, Cochrane, Pedro and Scopus. In order to perform the search, these keywords were used: Chronic Low Back Pain, Aspecific Chronic Low Back Pain AND/OR McKenzie, AND/OR Back School, AND/OR Global Postural rehabilitation, AND/OR GPR, AND/OR pilates, AND/OR Feldenkrais, AND/OR Alexander Method, AND/OR Mézières, AND/OR Souchard. Inclusion criteria were articles published in the last 5 years, randomized clinical trial, the mean age of patients between 18 and 70 years and full English text. Exclusion criteria were observational studies, case reports and articles without abstract or full text, CAM therapy and different rehabilitative approaches. Articles published between 2012 up to 2017 were included in the research. The flow-diagram showing the selection of studies is given in Figure 1. The outcomes that were used to review included: chronic pain, disability, QoL and psychological aspects. Figure 1 Flow diagram showing study selection. Abbreviations: CLBP, Chronic low back pain; GRP, global postural rehabilitation; PNF, proprioceptive neuromuscular facilitation. In total, 26 articles satisfied the inclusion criteria and were considered in the review: 14 articles on the pilates approach, six articles treating the MK method, three articles about GPR, one article concerning the Feldenkrais technique. In Table 1 a summary of articles included in the search is present, comparing different patient samples, interventions and outcomes in treatment of CLBP. Abbreviations: BREF, World Health Organization WHOQOL-BREF Quality of Life; G, group; GPR, global postural rehabilitation; h, hour; HRQOL, Health-Related Quality of Life; ISO, isostretching; MAIA, Multidimensional Assessment of Interoceptive Awareness; MCS, Mental Component Summary; MGPQ, McGill Pain Questionnaire; SF NRS, Short Form Numerical Rating Scale; NSAIDs, nonsteroidal anti-inflammatory drugs; PCS, Physical Component Summary; PIP, proprioceptive neuromuscular facilitation integration pattern; PNF, proprioceptive neuromuscular facilitation; QoL, quality of life; RMDQ, Roland-Morris Disability Questionnaire; RMQ, Roland-Morris Questionnaire; ROM, range of motion; SF-36, Short Form (36) Health Survey; SF-36v2, Short Form Health Survey version-2.0; T, time of evaluation; TENS, transcutaneous electrical nerve stimulation; VAS, visual analog scale. We have found no article about the Alexander method in the last 5 years. Concerning interventions with effect on proprioception, one article about Proprioceptive Neuromuscular Facilitation Integration Pattern (PIP) and one article about Proprioceptive Neuromuscular Facilitation (PNF) training were included in the review.44,45 No articles about Mézières were found in the research as a therapeutic solution of CLBP. The results of the analyzed studies were grouped together considering the effects on these outcomes: chronic pain, disability and function, QoL and psychological aspects. Chronic pain is the most important symptom of CLBP. Therefore, it is very important to determine how to improve it. The visual analog scale (VAS) and the numerical rating scale (NRS) are the most used scales to define this symptom, but some studies also use the Oswestry Scale, the Quebec Scale and the McGill Pain Questionnaire. Disability is another main topic of most articles examined; it is most often measured with Roland-Morris Disability Questionnaire and Oswestry Disability Index, and sometimes also with Waddell Disability Index and Patient-Specific Functional Scale. For this reason our search is also focused on QoL (evaluated with HRQOL Scale, Short Form (SF)-36, General Health Questionnaire, World Health Organization QoL -BREF instrument), global perception (evaluated with Global Perceived Effect Scale), specific disability (Patient-Specific Functional Scale), fear of moving (Tampa Scale, Falls efficacy scale-international), function perception (Patient-Specific Functional Scale, Global Perceived Effect questionnaire), Depression symptoms (Beck Inventory Scale) and mental-body interaction (Multidimensional Assessment of Interoceptive Awareness-MAIA). Katherinne Moura Franco did not find any difference between pilates with or without interferential current. Till date, based on what we know from literature, this is the first recent study that has tried to compare various postural methods. Of course, it must be taken into account as already mentioned, that ours is a narrative review that has not allowed us to statistically weigh the present studies in literature, but only to highlight the state of literature regarding this field. However, in clinical practice, the results of this study could be useful to clarify which approach is most appropriate in the management of chronic back pain considering the different therapeutic and beneficial effects of the methods discussed. We conclude that all the analyzed techniques have proved their efficacy with respect to the CG, but it is difficult to affirm the superiority of one approach as compared to another; they are more or less equivalent in reducing pain, reducing disability and improving the QoL. Some of the studies reported in this review included CG of patients who did not perform any rehabilitative treatment;16,19,31,33,40,47 other studies used the patient’s delivery of an information booklet about home-based exercises or ergonomic advices. These research studies concluded about a non-resolution of CLBP in the untreated group, that the natural history of progression of untreated lumbar chronic pain is to remain so with peaks of recurrences and a floating but unresolved pain. We can generally observe that the pilates, the MK method, the Feldenkrais method and BS improve the pain and are more efficient than just a generic, pharmacological or instrumental approach.24–26,30,33,34,36,41 Furthermore, studies using pilates technique have shown a good efficacy in improving chronic pain and physical function. We can also observe the same results in reducing disability and improving all psychological aspects we mentioned related to CLBP. Even GPR, in three articles, has shown very good results in follow-ups at 6 months and up to 1 year.36–38 Furthermore, the Mézières technique should be investigated because there are no randomized clinical trials or studies. Concerning PNF techniques, further investigations are needed in order to confirm their efficacy although results of reported studies are promising because of their multiple effects. Finally, as can be observed in the mentioned studies, BS technique has shown good results in patient education and improving QoL and in managing pain. We think that further scientific research is needed to strengthen the efficacy of the different techniques and to support an evidence-based approach to CLBP. Last AR, Hulbert K. Chronic low back pain: evaluation and management. Am Fam Physician. 2009;79(12):1067–1074. Andersson GB. Epidemiological features of chronic low-back pain. Lancet. 1999;354(91789178):581–585. Crombez G, Vlaeyen JW, Heuts PH, Lysens R, Crombez G. Pain-related fear is more disabling than pain itself: evidence on the role of pain-related fear in chronic back pain disability. Pain. 1999;80(1-2):329–339. Morone G, Paolucci T, Alcuri MR, et al. Quality of life improved by multidisciplinary back school program in patıents with chronic non-specific low back pain: a single blind randomized controlled trial. Eur J Phys Rehabil Med. 2011;47(4):533–541. Paolucci T, Morone G, Iosa M, et al. Psychological features and outcomes of the Back School treatment in patients with chronic non-specific low back pain. A randomized controlled study. Eur J Phys Rehabil Med. 2012;48(2):245–253. Henchoz Y, Kai-Lik So A, Henchoz Y. Exercise and nonspecific low back pain: a literature review. Joint Bone Spine. 2008;75(5):533–539. Hayden JA, Dunn KM, van der Windt DA, Shaw WS. What is the prognosis of back pain? Best Pract Res Clin Rheumatol. 2010;24(2):167–179. Lawand P, Lombardi Júnior I, Jones A, et al. Effect of a muscle stretching program using the global postural reeducation method for patients with chronic low back pain: A randomized controlled trial. Joint Bone Spine. 2015;82(4):272–277. Garcìa AN, Costa L, Hancock MJ, et al. McKenzie Method of Mechanical Diagnosis and Therapy was slightly more effective than placebo for pain, but not for disability, in patients with chronic non-specific low back pain: a randomised placebo controlled trial with short and longer term follow-up. Br J Sports Med. 2018;52(9):594–600. Korovessis P, Stamatakis M, Baikousis A, Korovessis P. Segmental roentgenographic analysis of vertebral inclination on sagittal plane in asymptomatic vs chronic low back pain patients. J Spinal Disord. 1999;12(2):131???137–7. Ebrahimi S, Kamali F, Razeghi M, Haghpanah SA, Ebrahimi S. Comparison of the trunk-pelvis and lower extremities sagittal plane inter-segmental coordination and variability during walking in persons with and without chronic low back pain. Hum Mov Sci. 2017;52:55–66. Coelho L. Mézières’ method and muscular chains’ theory: from postural re-education’s physiotherapy to anti-fitness concept. Acta Reumatol Port. 2010;35(3):406–407. Kamioka H, Tsutani K, Katsumata Y, et al. Effectiveness of Pilates exercise: A quality evaluation and summary of systematic reviews based on randomized controlled trials. Complement Ther Med. 2016;25:1–19. Moreno MA, Catai AM, Teodori RM, et al. Effect of a muscle stretching program using the Global Postural Reeducation method on respiratory muscle strength and thoracoabdominal mobility of sedentary young males. J Bras Pneumol. 2007;33(6):679–686. Castagnoli C, Cecchi F, del Canto A, et al. Effects in Short and Long Term of Global Postural Reeducation (GPR) on Chronic Low Back Pain: A Controlled Study with One-Year Follow-Up. ScientificWorldJournal. 2015;2015:1–8. Hasanpour-Dehkordi A, Dehghani A, Solati K. A Comparison of the Effects of Pilates and McKenzie Training on Pain and General Health in Men with Chronic Low Back Pain: A Randomized Trial. Indian J Palliat Care. 2017;23(1):36–40. Qaseem A, Wilt TJ, Mclean RM, Forciea MA. Clinical Guidelines Committee of the American College of Physicians. Noninvasive Treatments for Acute, Subacute, and Chronic Low Back Pain: A Clinical PracticeGuideline From the American College of Physicians. Ann Intern Med. 2017;166(7):514–530. Wong JJ, Côté P, Sutton DA, et al. 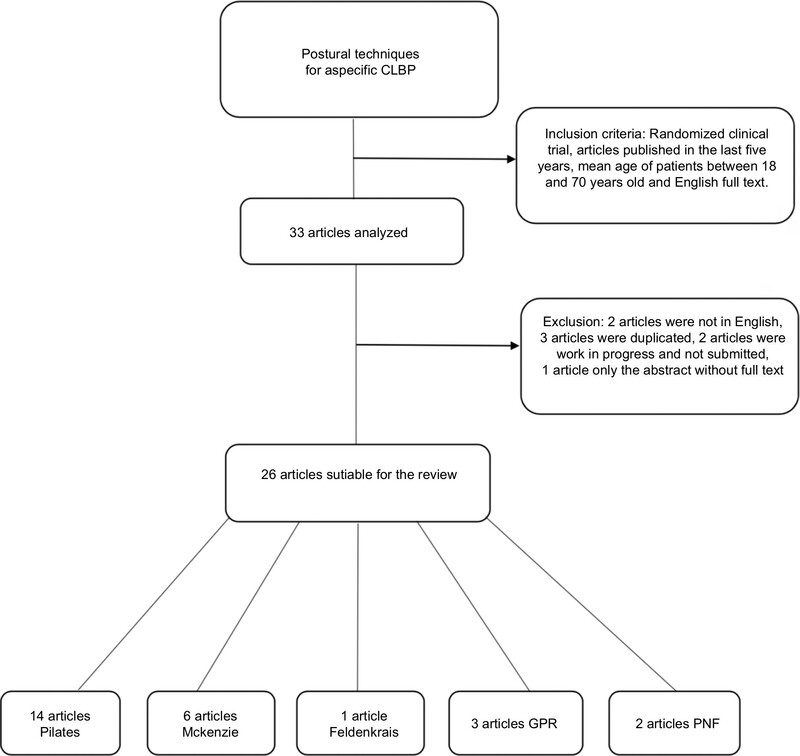 Clinical practice guidelines for the noninvasive management of low back pain: A systematic review by the Ontario Protocol for Traffic Injury Management (OPTIMa) Collaboration. Eur J Pain. 2017;21(2):201–216. National Institute for Health and Care Excellence. Clinical Guidelines. Low Back Pain and Sciatica in Over 16s: Assessment and Management. National Guideline Centre (UK). London: National Institute for Health and Care Excellence; 2016. Delitto A, George SZ, van Dillen L, et al. Low Back Pain. Clinical Practice Guidelines Linked to the International Classification of Functioning, Disability, and Health from the Orthopaedic Section of the American Physical Therapy Association. J Orthop Sports Phys Ther. 2012;42(4):A1–57. Negrini S, Giovannoni S, Minozzi S, et al. Diagnostic therapeutic flow-charts for low back pain patients: the Italian clinical guidelines. Eura Medicophys. 2006;42(2):151–170. Santilli Vet al. Linee guida ed evidenze scientifiche in medicina fisica e riabilitativa. Universit degli Studi di Roma. La Sapienza. 2017:265–298. Garcia AN, Costa LC, da Silva TM, et al. Effectiveness of back school versus McKenzie exercises in patients with chronic nonspecific low back pain: a randomized controlled trial. Phys Ther. 2013;93(6):729–747. Valenza MC, Rodríguez-Torres J, Cabrera-Martos I, et al. Results of a Pilates exercise program in patients with chronic non-specific low back pain: a randomized controlled trial. Clin Rehabil. 2017;31(6):753–760. Garcia AN, Costa LC, Hancock MJ, et al. Efficacy of the McKenzie method in patients with chronic nonspecific low back pain: a protocol of randomized placebo-controlled trial. Phys Ther. 2015;95(2):267–273. Hosseinifar M, Akbari M, Behtash H, Amiri M, Sarrafzadeh J. The Effects of Stabilization and Mckenzie Exercises on Transverse Abdominis and Multifidus Muscle Thickness, Pain, and Disability: A Randomized Controlled Trial in NonSpecific Chronic Low Back Pain. J Phys Ther Sci. 2013;25(12):1541–1545. Mostagi FQ, Dias JM, Pereira LM, et al. Pilates versus general exercise effectiveness on pain and functionality in non-specific chronic low back pain subjects. J Bodyw Mov Ther. 2015;19(4):636–645. Franco KM, Franco YD, Oliveira NB, et al. Is Interferential Current Before Pilates Exercises More Effective Than Placebo in Patients With Chronic Nonspecific Low Back Pain? : A Randomized Controlled Trial. Arch Phys Med Rehabil. 2017;98(2):320–328. Miyamoto GC, Costa LO, Galvanin T, Cabral CM. Efficacy of the addition of modified Pilates exercises to a minimal intervention in patients with chronic low back pain: a randomized controlled trial. Phys Ther. 2013;93(3):310–320. Szulc P, Wendt M, Waszak M, et al. Impact of McKenzie Method Therapy Enriched by Muscular Energy Techniques on Subjective and Objective Parameters Related to Spine Function in Patients with Chronic Low Back Pain. Med Sci Monit. 2015;21(21):2918–2932. Natour J, Cazotti LA, Ribeiro LH, Baptista AS, Jones A. Pilates improves pain, function and quality of life in patients with chronic low back pain: a randomized controlled trial. Clin Rehabil. 2015;29(1):59–68. Cruz-Díaz D, Martínez-Amat A, de La Torre-Cruz MJ, et al. Effects of a six-week Pilates intervention on balance and fear of falling in women aged over 65 with chronic low-back pain: A randomized controlled trial. Maturitas. 2015;82(4):371–376. Kliziene I, Sipaviciene S, Vilkiene J, et al. Effects of a 16-week Pilates exercises training program for isometric trunk extension and flexion strength. J Bodyw Mov Ther. 2017;21(1):124–132. Anand UA, Mariet Caroline P, Arun B, Lakshmi Gomathi G, Albert Anand U. A study to analyse the efficacy of modified Pilates based exercises and therapeutic exercises in individuals with chronic non specific low back pain: a randomized controlled trial. International Journal of Physiotherapy and Research. 2014;2(3):525–529. Halliday MH, Pappas E, Hancock MJ, et al. A Randomized Controlled Trial Comparing the McKenzie Method to Motor Control Exercises in People With Chronic Low Back Pain and a Directional Preference. J Orthop Sports Phys Ther. 2016;46(7):514–522. Adorno ML, Brasil-Neto JP. Assessment of the quality of life through the SF-36 questionnaire in patients with chronic nonspecific low back pain. Acta Ortop Bras. 2013;21(4):202–207. Castagnoli C, Cecchi F, del Canto A, et al. Effects in Short and Long Term of Global Postural Reeducation (GPR) on Chronic Low Back Pain: A Controlled Study with One-Year Follow-Up. ScientificWorldJournal. 2015;2015(2):1–8. Paolucci T, Zangrando F, Iosa M, et al. Improved interoceptive awareness in chronic low back pain: a comparison of Back school versus Feldenkrais method. Disabil Rehabil. 2017;39(10):994–1001. Cruz-Díaz D, Bergamin M, Gobbo S, Martínez-Amat A, Hita-Contreras F. Comparative effects of 12 weeks of equipment based and mat Pilates in patients with Chronic Low Back Pain on pain, function and transversus abdominis activation. A randomized controlled trial. Complement Ther Med. 2017;33(72-77):72–77. Murtezani A, Govori V, Meka VS, et al. A comparison of mckenzie therapy with electrophysical agents for the treatment of work related low back pain: A randomized controlled trial. J Back Musculoskelet Rehabil. 2015;28(2):247–253. Wajswelner H, Metcalf B, Bennell K, Wajswelner H. Clinical pilates versus general exercise for chronic low back pain: randomized trial. Med Sci Sports Exerc. 2012;44(7):1197–1205. Marshall PW, Kennedy S, Brooks C, Lonsdale C. Pilates exercise or stationary cycling for chronic nonspecific low back pain: does it matter? a randomized controlled trial with 6-month follow-up. Spine. 2013;38(15):E952–959. Young KJ, Je CW, Hwa ST, Cw J, Hwa St Young KJ. Effect of proprioceptive neuromuscular facilitation integration pattern and swiss ball training on pain and balance in elderly patients with chronic back pain. J Phys Ther Sci. 2015;27(10):3237–3240. Areeudomwong P, Wongrat W, Neammesri N, Thongsakul T. A randomized controlled trial on the long-term effects of proprioceptive neuromuscular facilitation training, on pain-related outcomes and back muscle activity, in patients with chronic low back pain. Musculoskeletal Care. 2017;15(3):218–229. da Luz MA, Costa LO, Fuhro FF, et al. Effectiveness of mat Pilates or equipment-based Pilates in patients with chronic non-specific low back pain: a protocol of a randomised controlled trial. BMC Musculoskelet Disord. 2013;14:16. Kofotolis N, Kellis E, Vlachopoulos SP, Gouitas I, Theodorakis Y. Effects of Pilates and trunk strengthening exercises on health-related quality of life in women with chronic low back pain. J Back Musculoskelet Rehabil. 2016;29(4):649–659.